As updated last night, today marks the first severe weather threat of the season for northeast Colorado. The primary threat remains damaging wind and hail across northeast Colorado, but conditions will also be favorable for isolated tornadoes, especially over the extreme northeast corner of the state. 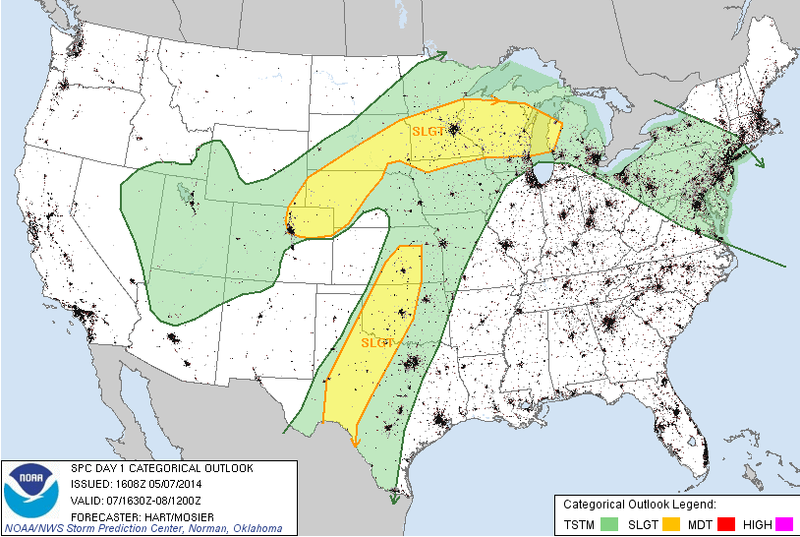 This morning the Storm Prediction Center (SPC) increased their coverage for Slight Risk of severe storms to include the greater Denver metro area. Storms are expected to form along the Front Range this afternoon then push east/northeast -- roughly along interstate I-76. We continue to believe locations north of I-70 stand the best chance of precipitation with this event, and locations north of I-76 will have greatest risk for severe weather today. Here's a look at the NAM simulated composite reflectivity for this afternoon. Notice where it pin-points greatest storm development, north of Denver. That said the potential exists for a few strong storms to develop along the I-25 corridor before pushing east. 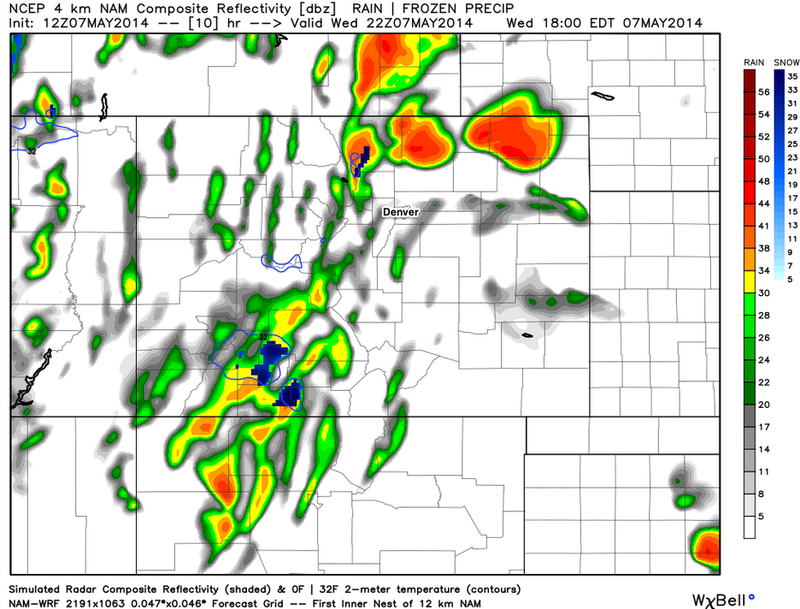 The NAM continues to trend wetter for Denver with this system as well -- bringing scattered showers and storms to the metro area well into Thursday. Other models have a similar idea, bringing a secondary bullseye for heavier precipitation south across the Palmer Divide. For Denver, we still expect most locations to be under an inch for total precip through Thursday, but a few locations (under heavier cells) could exceed this. 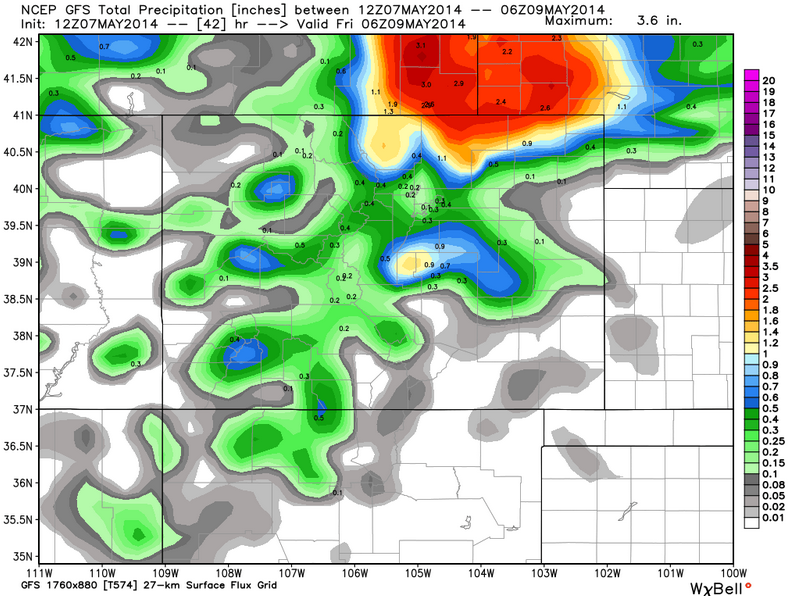 Areas along the northern border of Colorado could see precip totals in excess of 1" from this system. Here's a look at the GFS (left) total precipitation through Thursday night. Notice the core of heaviest precip sticks to northern border of Colorado, the NAM (right) is similar. Temperatures will be chilly behind the front, especially north of the Colorado border. Winter weather warnings and advisories are already in place for sections of western Nebraska and South Dakota where heavy snow could fall tonight into Thursday. Some of the rain across the Colorado/Wyoming could also mix with snow overnight Thursday -- a few of the models even showing accumulation in these areas. We'll continue to monitor the changing weather as we head into this afternoon and overnight Wednesday. If need be we'll fire up with Live Blog to track any severe weather that does fire this afternoon. If you're looking for updates, check there, and be sure to follow us on Twitter as well. We are continuing to monitor the next system on this one's heels due in for the second half of the weekend and early next week. Many of the models that showed a very progress pattern (in contrast to the Euro yesterday) have trended deeper and colder last night and this morning. This would increase chances for another round of wet weather for northeast Colorado -- and even a chance of snow for some. Stay tuned!